A round table meeting of the Organic Farm Advisory group took place this week with discussion on the successes and problems of last season. The need for relative efficacy continues and brings up the chance to revisit a timely article that was the result of last year’s discussion. What are my organic treatment options and how well do they work? As an organic grower, I sometimes accept less control, and more costly treatment than conventional farmers, but the information on efficacy is unclear. If Rutgers isn’t doing efficacy trials, can you sift through the literature to tell me what others have found that definitely works? Control of cabbage root maggot (CRM) is a timely example that illustrates the ‘struggle for relative efficacy’ in making organic recommendations when compared with conventional options. Forsythia in bloom–any day now–occurs at about the same time that farmers can expect CRM to damage their transplanted cole crops. Even light CRM infestations can kill small seedlings and transplants, delay crop development, and render root crops unsaleable. Higher populations can kill older plants or reduce yield. monitoring and control of CRM in cole crops. the use of online weather station degree-day (DD) data to predict CRM activity and timing of treatment – instead of relying on phenology. how the lack of field research capacity makes recommendations difficult for organic pest controls in comparison with conventional controls. why talent scouting (sifting through the literature) is an adjunct to research capacity, not a replacement. If you spend a lot of time in the field, you come to recognize forsythia in bloom and yellow rocket, a common roadside brassica weed, as nature’s reminders of CRM. However, relying on these indicators, referred to as “pest phenology,” is not as good as using the Rutgers supported NEWA online CRM Degree-Day calculator (base 40°F DD) from a weather station near your farm. Adult flies are not easy to see, so CRM can’t be scouted by walking fields. Monitoring fields for adult activity with yellow sticky card traps is helpful, but there are few signs of activity until plants wilt, and by then it is too late to act. NEWA can forecast emergence in your area. The first CRM adult flights for egg laying–quickly followed by maggot root damage–occurs at about 160 DD. When the first spring peak flights reach about 50% of fly emergence (about 250 DD), this is the time cole crops should be protected by an insecticide treatment or row cover barrier to exclude adult flies from egg laying. NEWA is a valuable tool – take time to learn how to use it. Acceptable levels of pest control vary among individual farmers based on preference and operation type. Rutgers advisors are uncomfortable recommending OMRI approved products that are labeled, but lack proven efficacy in controlled tests. Organic growers can’t afford to squander time and money on ineffective controls any more than conventional growers. Both organic and conventional growers suffer when NJ lacks local field research capacity. Vegetable research specialists create recommendation guides, direct efficacy trials, and shepherd effective treatments through the regulatory process. Literature searches to discover possible solutions found by non-NJ researchers cannot replace a lack of capacity, as is evident from the following. Ruth Hazzard at UMass has performed CRM efficacy trials with organic and conventional materials. 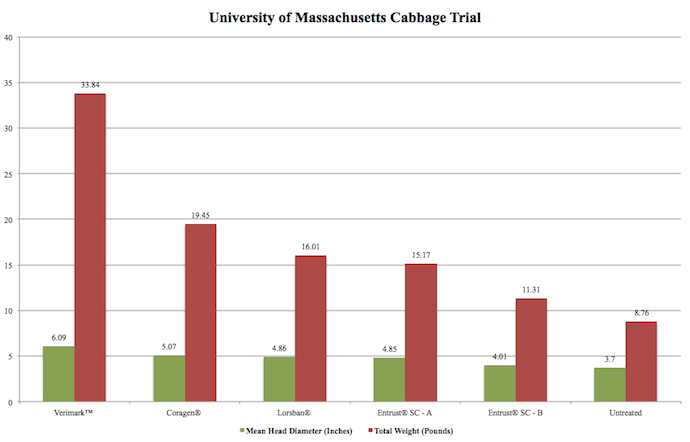 She released results from a cabbage field trial under high CRM pressure in 2014.
plot vigor and head weight yields. Conventional NJ growers have the benefit of Verimark, an extremely safe and highly effective CRM treatment labeled in 2014 and listed in the Commercial Vegetable Recommendations. When Ruth Hazzard compared a single pre-plant drench treatment with Verimark against other treatments, there was a large yield gain using Verimark over all other alternatives. A single Coragen drench resulted in cabbage yields that were not different from three applications of Entrust SC (Spinosad). Coragen does have a USEPA FIFRA Section 2(ee) recommendation label for use in cole crops transplant water in NJ (one of seven states) because research trials were conducted here many years ago by Vegetable Entomologist G. Ghidui. 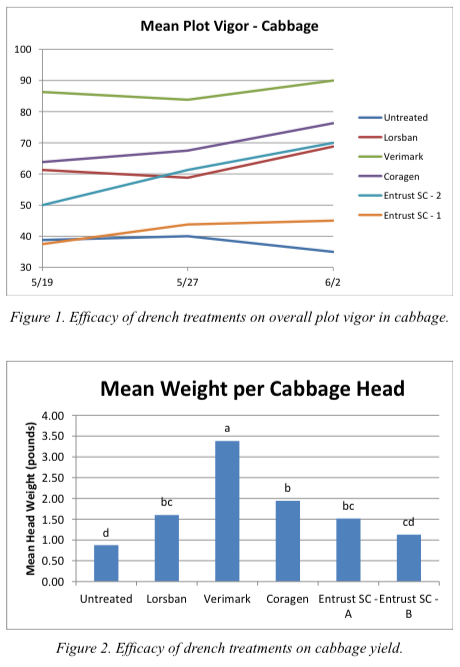 When two applications of the organic product Entrust SC (Spinosad) were banded at planting and again 14-days later (Figure 2, Entrust SC – B treatment), the cabbage plant vigor and head weight were no better than the untreated control. However, when a third application of Entrust was added as a pre-plant greenhouse tray drench (Figure 2, Entrust SC – A treatment), there was efficacy – about the same as the least effective conventional control, Lorsban, and not statistically different from a single drench with the conventional product Coragen. The problem is that while three Entrust SC (Spinosad) applications show efficacy, growers can’t use the organic Entrust SC (Spinosad) product for CRM. Despite being OMRI approved, and nationally labeled for worm pests on cole crops, Entrust SC (Spinosad) does not have a CRM label in NJ (it is labeled in California). While there are botanically derived insecticide active ingredients with organic OMRI approval on cole crops, e.g., azadirechtin or pyrethrin, they have no proven efficacy for CRM. The bottom line: Rutgers no longer has enough vegetable entomology specialists to take part in the field trials needed to support organic or conventional product label expansions for NJ. Verimark®: 13 fl. oz./acre, tray drench. Coragen®: 5 fl. oz./acre, tray drench. Lorsban®: 2.4 fl. oz./acre, banded application over row after transplant. Entrust A: 10 fl. oz./acre, tray drench followed by banded application at first adult flight, repeated at 16 day intervals as needed. Entrust B: 10 fl. oz./acre, banded application at first adult flight, repeated at 16 day intervals as needed. “Cabbage Maggot & Pest Control Efficacy” M. Infante-Casella & J. Rabin. Sustainable Farming on the Urban Fringe, 8 April 2015.